A few weeks prior to our flight, CS let me decide if I wanted to extend our stay in JPark Island Resort and Waterpark or transfer to another resort or hotel during our short trip to Cebu. I've always been fascinated by the photos from friends who have stayed in Crimson that's why I chose the latter and eventually booked a room at one of Mactan's premier resort. CS and I made sure that we arrive in Crimson just in time for check-in at 2PM so we don't have to wait much longer. Unfortunately, the room was still unavailable by the time we got in so after signing the forms, we headed to Azure Beach Club for some snacks with a few stops here and there to capture Crimson's elegant property. The lobby actually reminded me of Balesin with enough seats for everyone and tastefully decorated Filipino-themed rooms (see here for comparison). Apart from being a beachfront property, Crimson Resort and Spa takes pride in its 3-tiered infinity pool with depths of 2-feet, 3-feet and 4-feet to give everyone, from kids to adults, a wonderful time to bask under the sun. The different shades of blue that extends to the ocean is a beautiful sight that welcomes guests and guarantees an enjoyable and fabulous stay in Crimson. The resort offers complimentary use of Crimzone, a giant playhouse with plenty of toys that will surely give your kids a blast! There are also scheduled activities that kids can participate to such as story reading, educational games and challenges, and arts and crafts among many others. Cebu has many great resorts but I think that we made the right choice of booking Crimson Resort for this trip. Just look at our amazing view from our table at Azure Beach Club! After placing our orders, we asked the staff to look after our table so we can go and check it out. A closer look at the chairs and my hunch was right, the outdoor furniture were indeed Dedon collections. As I was on the verge of finishing my snacks, a staff approached us to inform CS and I that our room is now ready and the bags were already brought in by the resort staff. From Azure, we were led to our deluxe garden room, located just a mere 2-minute walk from the beach. The 44-sqm room is as beautiful in person as it is in photos! Everything from the king-size bed, the 40" LED television, elegant furniture and the spacious bathroom with a sunken tub that overlooks to a private pocket garden was just perfect and definitely exceeded our expectations. As Crimson's private beach is open until 5PM only (for security reasons), CS and I hurriedly changed into our swimwear and headed to the waters. The time that we had left was spent snorkeling at the resort's protected marine life with so many colorful fishes even at shore. Other water activities such as parasailing, speedboat tours, jet ski and banana boat ride are also available for a fee. 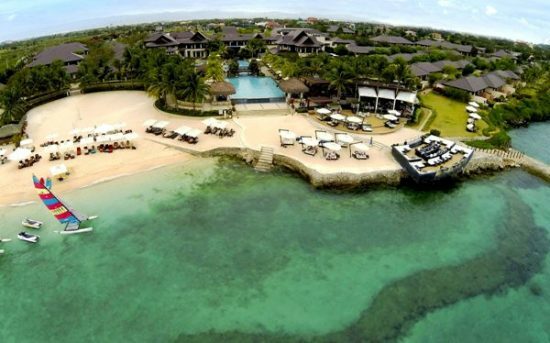 The resort's location is a little isolated and quite far from the main road but they offer daily complimentary shuttle service to SM and Ayala Mall Cebu on schedule. As we were only staying in Crimson for 2 days, we agreed not to leave and just enjoy our vacation in this stunning resort. Filipinos are known all over the world for being hospitable but from what I've observed in my years of traveling, there are certain places in the country where discrimination is quite prevalent. What I love about Crimson Resort Cebu is that even if majority of guests are foreigners, I never felt that the staff's treatment has changed regardless of who they are serving or talking to. The same excellent and friendly service all the time everywhere we go. Everything else is just a bonus! The quest for the best resort for me has ended as I have found my home in the Queen City of the South. Kudos to the wonderful team of Crimson Resort Cebu and I hope to be back again soon! Crimson Resort Cebu: Eat. Swim. Sleep. Repeat.